Arizona Roof Rescue » Blog » How Much Does It Cost to Rebuild an Arizona Roof? Getting a new Arizona roof can be one of the most expensive upgrades you make to your Arizona home, but it can also be one of the most important to maintaining or increasing the value of your home. A new roof installation can cost thousands of dollars, but if you let your roof fall into disrepair, you can take thousands off the value of your home. The price of a new roof depends on a lot of variables. Here are a few things that your contractor will discuss with you when putting together the price! Many home owners opt for asphalt shingle roofing because it is among the most economical of the options. The cost of a typical shingle roof is around $10,000, depending on the size of the roof. Tile roofing is also very popular on Arizona homes because it stands up well to the extreme heat during the summer. Typically, clay tile roofing costs about $700 to $900 per 100 square feet, and concrete tile costs about $400 per 100 square feet. The better the quality of the material that you choose, the more expensive it will be. However, the better the quality of the material, the fewer costs you will have for repairs and maintenance. You have to balance the initial investment with the long-term savings and the increased value of your home. Of course, the bigger your roof is, the more expensive a new roof installation will be. Roofing costs are estimated by “square,” which is equal to 100 square feet of roof space. If your roof has a steep pitch, has multiple levels, or has multiple elements like chimneys and vents, the cost will increase. You can also expect to pay more if your roof has multiple angles and gables. You might also consider adding accessories to your roof, such as sky lights or even solar panels. Each of these elements will add to the cost of your new roof, but they will also add significantly to the value of your home. Sky lights make your home feel more open and inviting, and solar panels can save you money on energy costs in the long run. 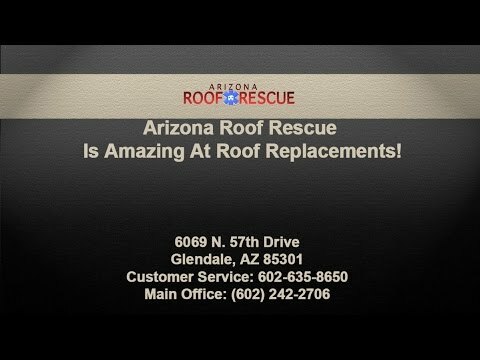 Arizona Roof Rescue Is Amazing At Roof Replacements! Every roofing contractor will set his own prices. One company may do the job for much more or much less than another. In addition to the factors listed above, your contractor will also include the preparation and labor into the estimate. For example, if you want the old roof removed, that will increase the overall cost. Arizona Roof Rescue is an experienced Glendale roofing contractor serving home and business owners throughout Arizona. We pride ourselves on offering some of the best rates in the state while also delivering some of the highest quality workmanship using only the best roofing materials. We’ll guide you through the roofing options for your property to help you understand how each will affect the overall cost and the long-term performance of your home. Your new roof installation should help you increase the value of your home, not just put a pretty cap on it. Home » Blog » How Much Does It Cost to Rebuild an Arizona Roof?